Discussion in 'Apple iPad News' started by iDan, Apr 10, 2010. I have to confess Iâ€™ve been caught napping a bit by the arrival of Mirrorâ€™s Edge on the iPad. The long-awaited iPhone version keeps getting put back further and further and still hasnâ€™t got a firm release date, so imagine my surprise to see that the iPad version has leap-frogged its way over the iPhone version, straight into the iTunes App Store charts. Great news for iPad owners, not so great for iPhone/iPod touch owners who will now have to wait even longer to play the iPhone game (or get an iPad). The iPad screenshots look even better than the iPhone screenshots that weâ€™d previously all been drooling over, and the early customer reviews are almost all raves (66 five-star ratings out of 91 so far). Exclusive features listed for the iPad include HD visuals, face-to-face multiplayer action, and iPad optimized race environments. 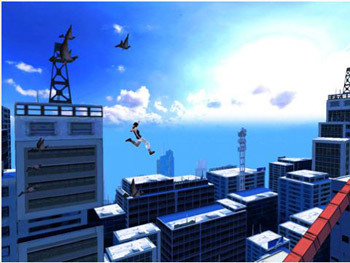 It certainly looks amazing, and there are a lot of gamers out there whoâ€™ve been patiently waiting for Mirrorâ€™s Edge to arrive on iPhone who might not even realise itâ€™s already out on the iPad! As far as I've seen tho the gameplay is really lacking, basically swipe to run on rails then swipe to jump...repeat. It looks really nice tho.